Allen's has cards for every holiday and occasion. We even have anytime cards so you can give a card to a friend or loved one just because. 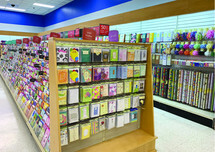 Our Card$mart card line is 50% off every card, every day, plus we have a large selection of .99¢ cards. Allen's also offers a wide variety of gifts, decor and religious items for every occasion that meet the needs of both young and old. Celebrate in style with Allen's! Brighten anyone's day with our in-town balloon delivery. Allen's also offers custom napkin imprinting to commemorate any occasion, whether it's a wedding, graduation or baby shower! Please stop in or call us at (402) 463-5633 and we will be glad to assist you.